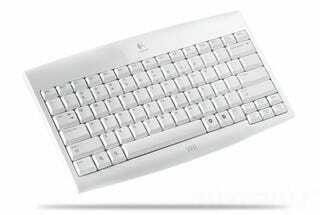 Here's Logitech's new, officially licensed QWERTY keyboard for the Wii. It's wireless, it's a keyboard, and yes, it's the requisite white. It also has a few Wii-specific additions, like dedicated buttons for zoom, quit, ok, etc. It'll communicate via a dongle, should be out next month, will be a must-buy for Animal Crossing (which will support keyboards) and will cost $50.